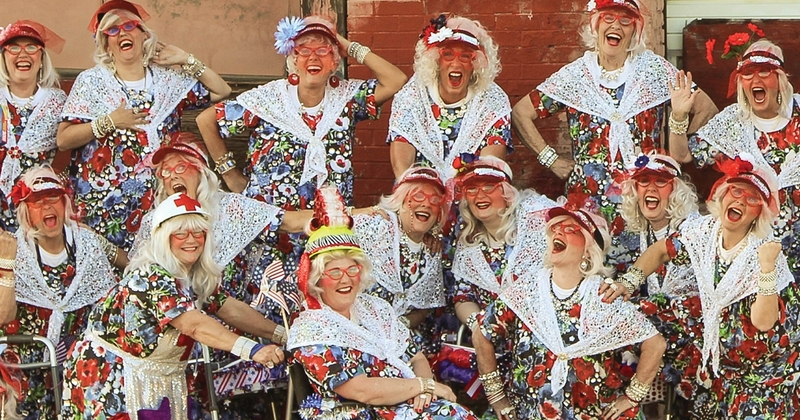 Flaunting their flamboyant outfits and radiant smiles, the Red Hot Mamas pack a whole lotta love in their comically choreographed dance routines, whether at parades, presidential inaugurations, or assisted living homes. To celebrate Valentine’s Day, they will visit assisted living homes “to sing, dance, goof around, visit, and give Valentines,” said Mikki Stevens, 70, who started the female theatrical dance troupe in 1991 in Coeur d’Alene, Idaho. Stevens, president of the Red Hot Mamas, said she started the group to answer the question “Is that all there is?” as women age. With those ideas in mind and envisioning an entertainment and community service ensemble, Stevens began brainstorming when she and Dennis returned to her hometown, Coeur d’Alene, after living throughout the West. While her husband worked in restaurant management and later construction, she earned her income as a dancer, fitness trainer, natural body builder, actress, and voice animator of several roles, including the teenage Pebbles, the famed Flintstones’ daughter. At the Red Hot Mamas’ first audition, 40 like-minded ladies showed up, embracing Stevens’ idea of performing in a Fourth of July parade. Today, the troupe has about 40 members from all walks of life, ranging in age from 18 on up into the 90s. They have also performed for the Macy’s Thanksgiving Day Parade three times; the New Year’s Day Celebration in London, England; television shows; college football bowls; and parades nationwide. The VFW honored them with the Americanism Award for their original script and performance of “The Triumph of the American Spirit” to benefit 9/11 relief efforts. They also offer motivational programs. The Mamas’ most recent prestigious parade they participated in was the 64th annual Nashville Christmas Parade to benefit the Monroe Carell Jr. Children’s Hospital at Vanderbilt. They wore large silver cowboy hats topped with Christmas gifts, red sequin aprons with silver stars, and baskets filled with gifts and teddy bears hanging from their walkers. She attributes her inspiration, energy, and love of laughter and joy to her relationship with God. To infuse herself with energy and peace throughout the day, she reads Bible verses she has written on cards. Psalm 46:1-3 reminds her God is her refuge and strength. Matthew 5:14-16 advises her to be the light of the world. Proverbs 3:4-5 encourages her to trust the Lord with all her heart. As they dance, it is hard to say who benefits more — spectators or the Mamas who feel a connection with their audience while executing amazingly nimble movements with walkers or shopping carts or even pink flamingo inner tubes resting on their hips. Her most memorable event was President George W. Bush’s first inaugural parade. Welts joined the Mamas in 1997 after seeing them in a Memorial Day parade. She said every parade has special moments of interacting with spectators. Connecting with spectators is unforgettable for Deborah Miranda, 47, the Mamas’ performance director. She strives to make eye contact along a parade route. Miranda, operations manager of Northwest Tile and Floors in Coeur d’Alene, and other Mamas commit to rehearsals twice a week at donated parking lots and a dance studio at Spokane Valley Jazzercise. Along with dance, they are trained in theatrical performance skills, stage makeup, costuming, choreography, drill team, sound tech, and properties management for public presentation. The Mamas’ next auditions will be in spring. “We keep it flexible and let girls choose which events they want to perform in during the year, and they commit to rehearsals for those events,” Stevens said. Members pay $20 monthly dues to pay administrative costs for insurance, storage, their webpage rhmama.com, accounting, and other items. The annual costume fee ranges from $100 to $150. Stevens emphasized the Mamas’ main purpose is community service.